I found the recipe here. 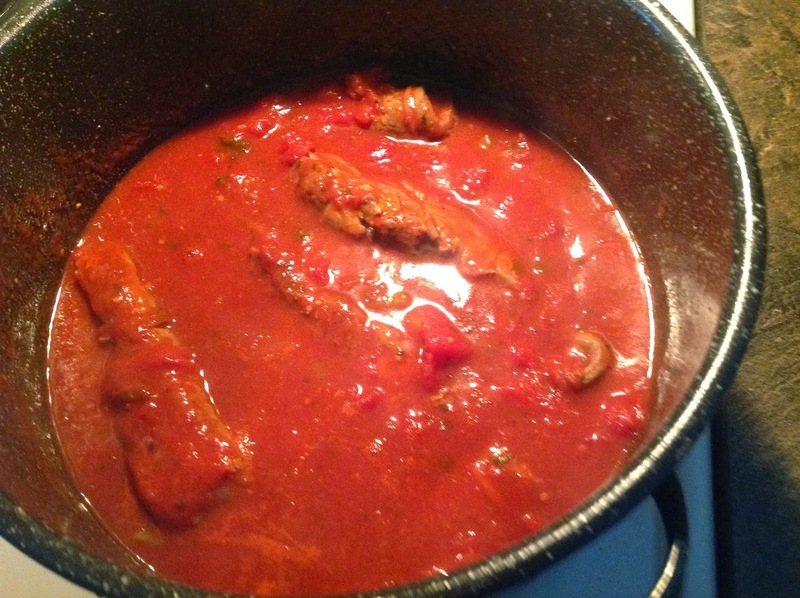 (UPDATED link, 1/10/18: http://www.geniuskitchen.com/recipe/neapolitan-meat-sauce-ragu-napoletano-alla-anna-galasso-281154.) From what I've read, Naples is the source of much of what Americans know as Italian, so I thought, let's try something as authentic as I can find. In any case, it sounded delicious! 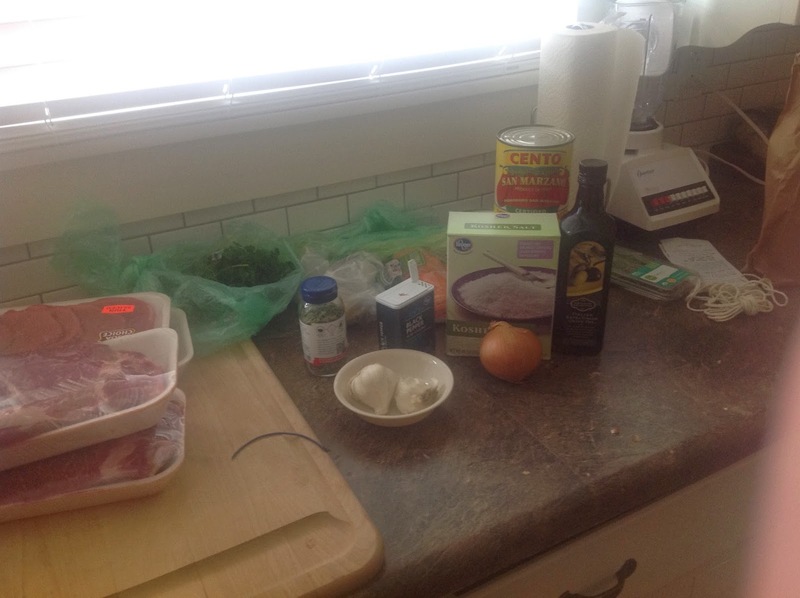 First I had to get all the ingredients. I had to go to a second Krogers for the pecorino romano. Guess what? Not in Sidney, but in humble Piqua! Hah! (Turns out I had enough pecorino already in my fridge that I'd forgotten about, but this is delicious cheese; it won't go to waste.) Fresh basil was unavailable at either store, and I wasn't going to drive to Troy or Dayton for it; so, I used dried basil. Included in that cornucopia are a pound and a half of round steaks, six meaty spare ribs, some fresh parsley, garlic, the blasted dried basil, salt and pepper, onion, olive oil, some tomatoes, and cheese, celery and carrots. Oh, and some string (you'll see). Some of this I already had; I just got it all out so I wouldn't have to go hunting for it. 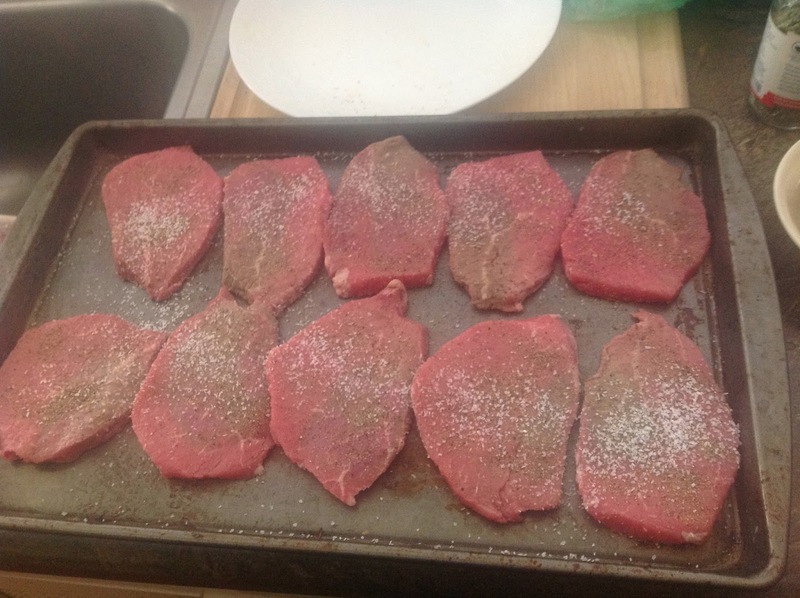 So, first it said to pat the round steaks dry with a paper towel, and then rub them with salt and pepper. It didn't specify regular or Kosher salt; I opted for the latter. 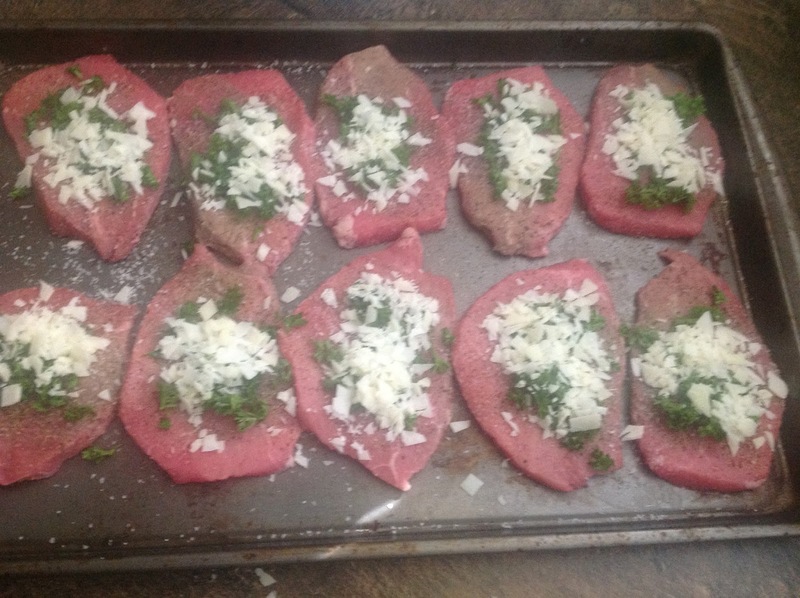 I also had to mince some parsley and grate some cheese. I did this by hand. (I think it's time to get a food processor.) What do you think -- would the Osterizer have worked? I was reluctant to use it, for fear it would liquify the parsley. I didn't get these ingredients as fine as I might have liked, but that means it's "rustic," eh? 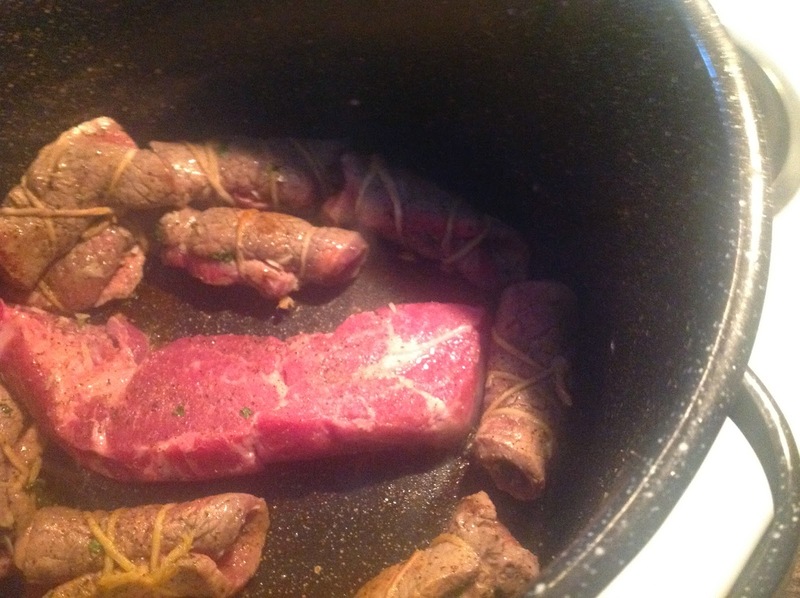 Next, some olive oil goes in the pan to heat up, then the meat goes in to brown. My pan has a raised area in the middle, that's a pain, but I made it work. You can see all but one piece of meat was removed. 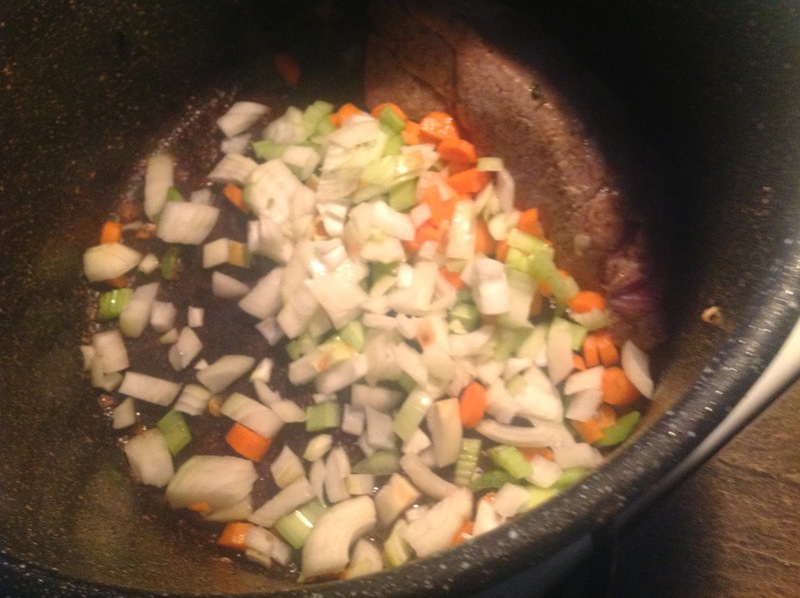 I was to cook this in the oil till the vegetables began to get soft. While the meat and vegetables were cooking, I prepared the tomatoes. I had bought whole tomatoes, so I had to crush them. Yes, you can get them crushed; but I wanted to use this particular type of tomato: San Marzano; and I only found whole. So I squished them with my hands, which proved a bit more hazardous than I expected. Then the recipe called for a half-cup of dry red wine. I opted for Cabernet. What do you think? Oh, I forgot something. When I took the meat out, that raised area in the middle had some nice brown bits; I decided to deglaze that. So I used a bit of the wine for that. A little more wine could hardly hurt, right? After the vegetables had cooked awhile, I added the garlic and basil -- wow, did that smell good! -- then after a minute or so, the tomato-wine mixture. This I brought to a boil, and then turned down to simmer. For at least an hour and a half. Dinner looks to be about 9 pm (after an 8 pm meeting). Those are clean dishes, which I leave for the angels to dry. They always do a great job! The recipe called for taking the meat out once it was falling off the bone, which I did. It also called for cooling the meat in the fridge, so it would be easier to cut. If it hadn't been past 9 pm at that point, I'd have done so (it would have given the sauce more time to cook); but I was ready to eat. This is probably the best thing I have ever cooked! If this is anything like what Ragu is like in Naples, I can't wait to visit Naples. You'll notice I didn't put any cheese on it. My understanding is that in Italy, they don't always put cheese on pasta. I tried it without, and it was delicious. I had a little more -- to use up the remainder of the spaghetti, of course, because it was too little to put away -- and I did put some parmesan/romano cheese on it. Wonderful, but not really necessary. I've got a lot of it left over, so I'm going to enjoy this for several days. > This wasn't all that hard. Rolling up the round steaks and tying them was the most tedious. If I recruit another set or two of hands, very easy (are you paying attention, seminarians who will be here this summer?). And, I could easily double the quantity. > I think I can improve this a little. The sauce had a little separation; there could be a couple of reasons for that, but I think I can fix that. Also, the round steak rollups were a little bit of a disappointment (but the rib meat was wonderful); I might try a different cut of meat (more expensive), or even try using meatballs or sausage. > Best of all, this gives me the basics of the sauce, which I am eager to experiment with. I'd never made a tomato sauce with celery, carrots and onion; but anyone who cooks knows these are the basics of any good sauce. Now I know how to do it. Here's what I don't understand: why haven't I ever had anything like this till now? I don't see why a sauce like this couldn't be marketable; I don't know why Italian restaurants don't have anything like this. It's not that hard to make, and it'll keep. Postscript: I have two spareribs left I didn't cook. Any suggestions? Those Rinderrouladen look really good! Are you going to serve them with pasta? I love Italian food. In Germany, the Italian food is familiar to an American, but it's a little bit different. Hard to explain. But there is an Italian restaurant here in the greater Los Angeles area that was recommended to me by a German friend. The food is remarkably similar to Italian restaurants in Germany. That sauce indeed looks genuine as my Neapolitan relatives prepared it, complete with the variety of meats and the Braciole. I also did enjoy the Rouladen with red cabbage and Spatzle as my German relatives prepared them. My favorite way to eat rouladen is to spread mustard on the meat, then cover with sautéed bacon (not to crisp) and sautéed onions. 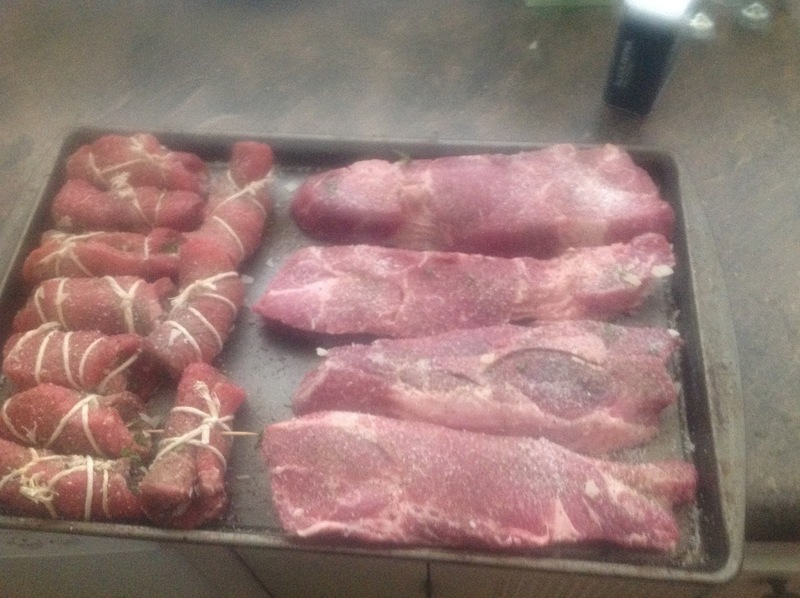 Roll and tie the meat and brown. Add some water and simmer for about 1/2 hr. maybe more, depending on the thickness of the meat. 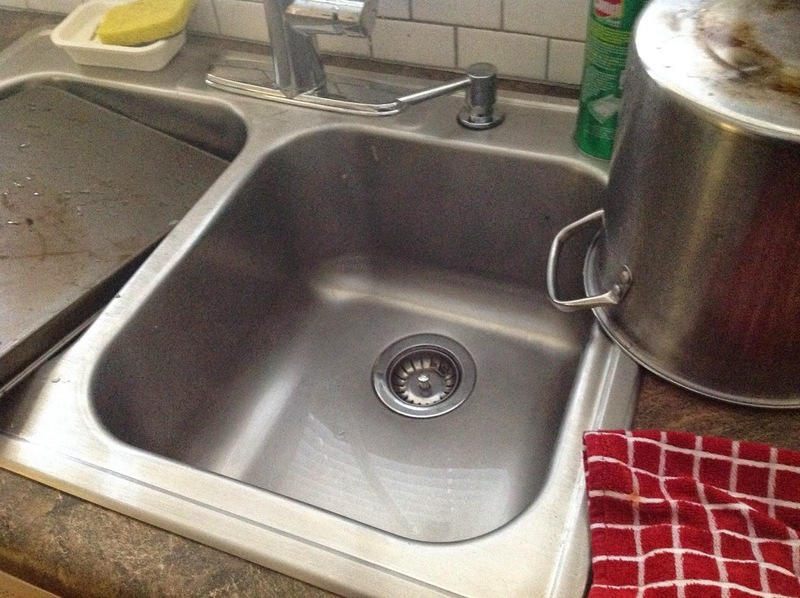 You can make gravy with the liquid in the pan. Yummy! 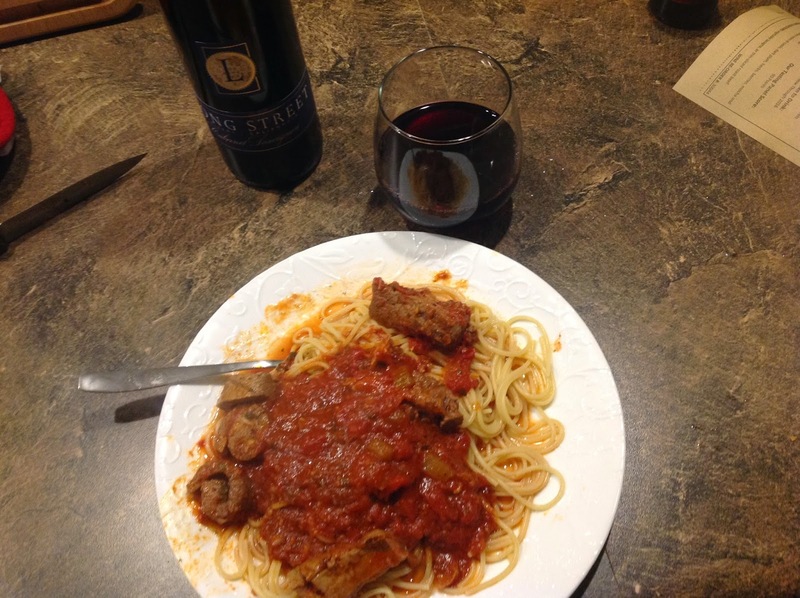 A great Italian post and you Krauts have to talk about rouladen!! 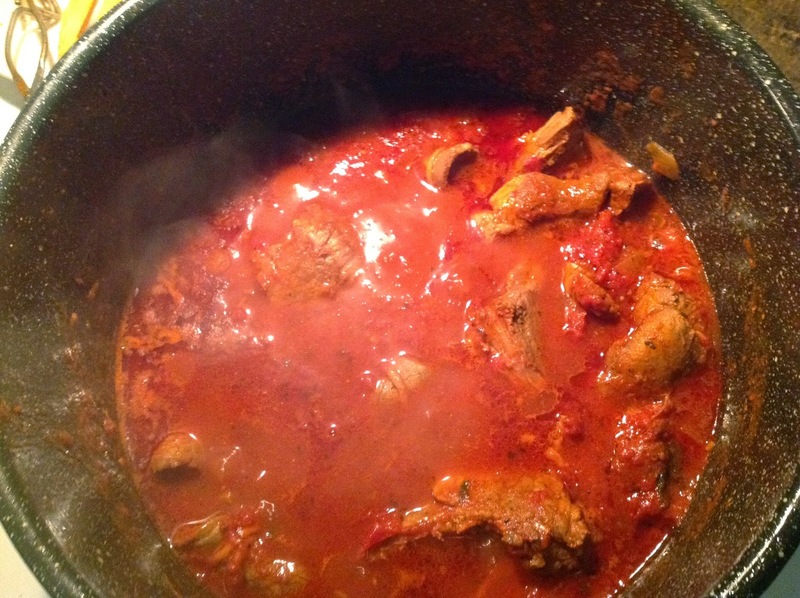 Pork was always part of my Dad/Mom's Sunday sauce. It is a natural sweetener. My paternal grandma was from Naples, and this is authentic.